If you’re a regular cigar enthusiast looking for an average-sized humidors, this guide has been tailored according to your needs. Following our detailed resources for the best humidors, this guide breaks down the best medium-sized options. You can use the links above to jump ahead. Otherwise, head to the menu below to see what else we’ll be covering in this guide. What Are The Best Medium Humidors? If you’re looking for a truly luxurious humidor, you can do far worse than the stunning The Statesman range by Davidoff. Handmade by a French Living Heritage Company (Entreprise du Patrimoine Vivant), the lining is crafted from Okoume. The unique benefit of this exotic African wood is that it doesn’t require seasoning. While they’re hard to find, these beautiful pieces of art are certainly worth the investment. We do love the Old Glory humidor by Quality Importers. In fact, we’ve relied on this very humidor for a good number of years and we have yet to be let down. After seasoning, it provides an excellent climate for your cigars. Furthermore, the seals are just about as airtight as you can get from a wooden humidor. However, we removed the supplied devices in favour of a third-party digital hygrometer and Boveda humidity packs. Here is another humidor that we’ve been using for several years. Originally attracting by its stunning black ebony and maple finish, we were very satisfied with its excellent performance. Like the Old Glory, though, we discarded the supplied devices. Instead, we’ve equipped this humidor with a Boveda mounting plate to store a 320g pack as well as a Boveda Butler for tracking the humidity. Like the Gurkha above, the Boveda acrylic humidor is one of the smaller options on this list. However, it’s an impressively designed humidor, which offers a low-maintenance storage solution. Made entirely from acrylic with magnetic clasps, the interior is airtight with no noticeable moisture leakage. Designed with Boveda’s own humidity packs in mind, they’re stored in a convenient and accessible compartment. They’re also able to last for a full year if stored in the right environment! If you’re someone who likes a precisely-categorised cigar collection that we highly recommend the Adorini Genova. It has been designed with unique separators that can be adjusted as well as labelled. Furthermore, the height of the shelf can be adjusted while the lid is magnetic, which allows you to replace your devices. Here’s a premium humidor that we couldn’t resist. The critically-acclaimed Daniel Marshall has been handcrafting premium humidors in Santa Ana, California since 1982. This particular signature humidor is made from black ebony with a thick Spanish cedar lining. The resulting seal is excellent to say the least while the supplied digital hygrometer and humidifiers work well. We’ve tested a number of cigar coolers, which you can see in the guide linked below. Out of all of them, the CC-100H offers the best overall performance and great value for money. Its temperature range is wide enough for any cigar collection and it’s equipped with Spanish cedar shelves. This cooler can store up to 250 cigars. Therefore, it’s quite large as humidors go. Nevertheless, this is on the lower scale of coolers in general. The only thing that disappointed us was how it was equipped with an analogue rather than digital hygrometer. On the high end of medium is this very spacious desktop humidor. Able to store as many as 250 cigars, it’s quite large but sits low for easy access. Furthermore, the lid is lined with a magnetic sheet so you can easily remove and replace you devices. This made it easy for us to switch the humidifiers out with our preferred solutions from Boveda. Meanwhile, the supplied digital hygrometer works well but requires calibrating before being used. Overall, medium-sized humidors are the most versatile storage solutions for the majority of cigar collectors. While it’s very easy to run out of space and overfill a small humidor, sometimes large ones are just too big. With medium humidors, this is unlikely to happen. Most offer a reasonable storage that oscillates around 100 cigars, which is plentiful for the majority of cigar enthusiasts. A 100 count cigar should be fine with even with just a box’s worth of cigars, which is often between 20 to 25 sticks. However, you may want to include a few sheets of Spanish cedar to absorb any excess moisture. Given their slightly smaller size, the contents are quite easy to manage and you’ll be able to place your collection how you want. In most cases, there should be enough space between them for air to circulate too. Furthermore, medium-sized humidors aren’t going to take up too much space. Whether you want to keep it somewhere discreet or use it as a room’s centrepiece, you’ll be able to easily find somewhere to place it. However, if your collection is in the process of growing, you may be surprised how quickly you can fill one of these up. This can be frustrating when it happens as you may just not have enough room. Nevertheless, you should avoid overfilling your humidor. If you do, you’ll prevent air from circulating, which prevents moisture from being diffused evenly throughout the humidor. As a result, you’ll get some moist pockets and dry areas too. If or when this happens, you can either purchase another humidor of equal of greater size. Otherwise, you may want to keep your humidor for presenting your cigars that are ready to smoke. Meanwhile, you could store the bulk of your collection to age in a coolidor. Finally, even if medium-sized humidors are of a manageable size, they’re still quite bulky. As such, it may be hard to find somewhere to properly keep it. What Humidifiers Do You Need For Medium Humidors? Medium-sized humidors are generally quite easy to sufficiently humidify as most devices are designed for their average cigar counts. However, it can quickly become a nightmare if you use devices that aren’t adapted to this sort of storage. Most humidors are supplied with floral-foam humidifiers, which we insist that you discard immediately. These cheap humidifiers are usually unreliable and require regular recharging. Furthermore, they continuously diffuse moisture only in the surrounding area. Any nearby cigars will be exposed to high humidity while those that are further away may get nothing at all. We’ll soon be providing a full guide to humidifiers to help you choose the right devices to use in your humidor. In the meantime, we’ll provide some of our favourite recommendations. For humidors with a cigar count of between 100 to 300 cigars, we believe that Boveda offers some of the most reliable and versatile humidification devices that you can get. Remember that the number of packs used should reflect the humidor’s capacity and not the actual number of cigars inside it. We regularly use both of the above and they work well. The larger 320g packs are ideal for vast environments and they diffuse evenly across the whole humidor. 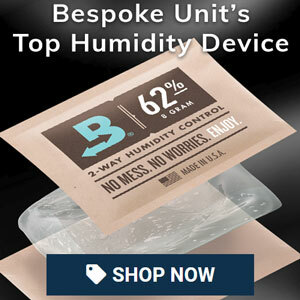 As you can’t over-humidify with Boveda, one of these is perfectly fine for a 100-count cigar humidor. Meanwhile, the smaller 60g packs are great for either smaller humidors or by using several for larger ones. Thanks to their two-way humidity control, they absorb excess moisture. Therefore, you can be assured that they will maintain a consistent relative humidity level. There are also several levels to choose from. While we tend to use 69% for most of our cigars, you can also opt for 65%, 72% or 75%. Finally, don’t forget to season your humidor if it’s either made from wood or has wooden parts. Reviewed by John Q., on 2nd November . "A wide variety to choose from. A great guide with lots of quality humidors!"